The bacterium Burkholderia pseudomallei causes a life-threatening disease called melioidosis. In vivo experiments in mice have identified that a rapid IFN-γ response is essential for host survival. To identify the cellular sources of IFN-γ, spleen cells from uninfected mice were stimulated with B. pseudomallei in vitro and assayed by ELISA and flow cytometry. Costaining for intracellular IFN-γ vs cell surface markers demonstrated that NK cells and, more surprisingly, CD8+ T cells were the dominant sources of IFN-γ. IFN-γ+ NK cells were detectable after 5 h and IFN-γ+ CD8+ T cells within 15 h after addition of bacteria. IFN-γ production by both cell populations was inhibited by coincubation with neutralizing mAb to IL-12 or IL-18, while a mAb to TNF had much less effect. Three-color flow cytometry showed that IFN-γ-producing CD8+ T cells were of the CD44high phenotype. The preferential activation of NK cells and CD8+ T cells, rather than CD4+ T cells, was also observed in response to Listeria monocytogenes or a combination of IL-12 and IL-18 both in vitro and in vivo. This rapid mechanism of CD8+ T cell activation may be an important component of innate immunity to intracellular pathogens. Burkholderia pseudomallei is a Gram-negative bacterium, which is a major cause of community-acquired septicemia and pneumonia in endemic areas of Southeast Asia and Northern Australia. The clinical features of melioidosis are extremely varied and range from acute sepsis to chronic infections (1). There is considerable evidence that host resistance is strongly influenced by the cell-mediated immune response. B. pseudomallei survives and multiplies in human phagocytic and nonphagocytic cells in vitro (2). Inhibition of B. pseudomallei growth occurs in IFN-γ-activated murine macrophage cell lines, and the bacteria were susceptible to the killing effects of chemically generated NO and superoxide anion in a macrophage-free system (3). However, neither the sites of latency nor the mechanism whereby the bacterium evades the host immune system or induces protective immunity have been identified. Our previous studies have established murine models of both acute and chronic melioidosis, which mimic many features of the human pathology and provide the first evidence of host resistance mechanisms against B. pseudomallei in vivo (4). Infection with high doses of B. pseudomallei results in acute disease and death within 2 days. In contrast, at lower doses mice were able to clear the inoculum over a 3- to 4-wk period, but persistence of the organism resulted in a chronic infection. Resistance was absolutely dependent upon the production of IFN-γ in vivo within the first 24 h after infection, as administration of neutralizing mAbs against IFN-γ lowered the LD50 by ∼100,000-fold. These results demonstrated the obligatory role of early production of IFN-γ to host survival against B. pseudomallei infection. For many intracellular pathogens such as Listeria monocytogenes, Salmonella typhimurium, and Toxoplasma gondii (5), the rapid production of proinflammatory and phagocyte-activating cytokines by NK cells is a key factor of early host resistance against infection (6). The triggering of NK cells for IFN-γ production involves the synergistic action of TNF-α and IL-12 (7). IL-18 is also a potent inducer of IFN-γ, acting in synergy with IL-12 (8, 9, 10, 11). In vivo functions of IL-18 have been studied recently in many intracellular infections, such as Yersinia enterocolitica, Mycobacterium spp, Cryptococcus neoformans, and Salmonella typhimurium (12, 13, 14), and reveal a key role for IL-18 in early host resistance to infection. The purpose of this study was to identify the cellular sources of IFN-γ, which is rapidly produced in response to B. pseudomallei in the naive host. As predicted from our previous studies with other intracellular pathogens (6), B. pseudomallei was a potent inducer of IFN-γ production from splenic NK cells in vitro. More surprisingly, CD8+ TCRαβ+ cells from previously uninfected mice were also rapidly activated for IFN-γ production via a cytokine-dependent bystander mechanism involving the synergistic action of IL-12 and IL-18. We propose that this novel pathway of CD8+ T cell activation may be an important component of the innate IFN-γ response against intracellular pathogens. B. pseudomallei strain 708A is a gentamicin-sensitive isolate, originally obtained from the splenic abscess of a melioidosis patient, and has been used in the previous studies of animal models and cell biology in our laboratory (4, 15, 16). For this project, bacteria were subcultured onto Columbia agar (Oxoid, U.K.) for 24 h at 37°C, then scraped and resuspended in sterile pyrogen-free saline. The number of viable bacteria was determined by colony-forming counts before γ irradiation with ∼5 × 104 rad for 2 h (Gammacell 1000 ELITE, Wizard, U.K.). γ-Irradiated B. pseudomallei were aliquoted and stored in PBS plus 10% v/v glycerol at −70°C. Before use, an aliquot of the bacteria was thawed, washed twice in RPMI at 10,000 × g for 5 min, and added to cells as described below. Female mice at 8–10 wk of age were used throughout this study. C57BL/6 mice were obtained from Charles River (Margate, U.K.). μMT mice (n = 6 to C57BL/6) were originally obtained from Bantin & Kingman (Hull, U.K.) and bred under aseptic conditions in filter top cages at the London School of Hygiene and Tropical Medicine (London, U.K.). The following recombinant murine cytokines were used: IL-2 (PharMingen, San Diego, CA), IL-12 (1.67 × 106 U/mg; Genzyme, Cambridge, MA), IL-18 (PeproTech, London, U.K.), and TNF-α (2.7 × 108 U/mg; Genzyme). The following mAbs against mouse cytokines were used for neutralization: anti-IL-12 (C17.8, rat IgG2a; a kind gift from G.Trinchieri, Wistar Institute, Philadelphia, PA), anti-TNF (TN3.19.12, hamster Ig) and H22 (hamster Ig) (kind gifts from R. D. Schreiber, St. Louis, MO), and isotype-matched control Abs, GL117.4 and L2, respectively. Anti-mouse IL-18 (39-3F, rat IgG1; MBL, Nagoya, Japan) and rat IgG1 isotype control (PharMingen) were also used for neutralization studies. Naive mice were killed by cervical dislocation, the spleens removed aseptically, single cell suspensions made by passing through sterile meshes, and erythrocytes lysed using Tris-buffered ammonium chloride. The resulting cell suspensions were washed twice in RPMI, counted by trypan blue exclusion staining, and adjusted to 6 × 106 cells/ml. The cells were suspended in RPMI 1640 medium (Life Technologies, U.K.) supplemented with 10% FCS, 10 mM l-glutamine, 25 mM HEPES, 200 U/ml penicillin, 200 μg/ml streptomycin, 50 μM 2-ME, and 10 μg/ml indomethacin. Cells were plated at 100 μl/well in 96-well flat-bottom cultured plates (Life Technologies, Paisley, U.K.) and incubated with 100 μl/well stimulus or medium control in 5% CO2 at 37°C for 24–48 h; the supernatants and/or cells were harvested for analysis of cytokine production. Spleen cell culture supernatants were assayed for IFN-γ production by double Ab sandwich ELISA. Plastic 96-well microtitration plates (Immulon 2; Dynatech, Sussex, U.K.) were coated with a mAb to IFN-γ (H22) at 5 μg/ml in 0.1 M carbonate-bicarbonate buffer (pH 9.6) overnight at 4°C. The excess reagent was removed by washing the plates three times with 0.05% Tween 20 in PBS, and this was repeated between each of the following reagent layers. Test supernatants and a murine IFN-γ standard (from 1.2 to 20 ng/ml; Life Technologies) were added and incubated for 1 h at 37°C. Then, rabbit anti-IFN-γ (1:1,000) was added and incubated for 45 min at 37°C. Goat anti-rabbit Ig conjugated to HRP (1:10,000; Kirkegaard & Perry Laboratories, Gaithersburg, MD) was added and incubated for 45 min at 37°C, followed by tetramethylbenzidine substrate (Boehringer Mannheim, Mannheim, Germany), and read at 450 nm with a Dynatech MR5000 plate reader. A similar protocol was performed for detection of TNF, except in this case using 5 μg/ml monoclonal rat anti-mouse TNF mAb (TN3.19.12) for the coating step, rabbit anti-TNF (1:1000) for the second Ab step, and a mouse rTNF-α standard (Genzyme) ranging from 1.6 to 18.5 ng/ml. For the detection of IL-12p40, rat monoclonal anti-mouse IL-12 (C15.6; Cambridge Bioscience, Cambridge, U.K.) was used at 2.5 μg/ml for coating onto plastic 96-well microtitration plates (Immulon2; Dynatech) overnight at 4°C. The excess reagent was washed out three times with 0.05% Tween-20 in PBS, and this was repeated between each of the following steps. This was followed by a 0.5% BSA-blocking step for 60 min at room temperature, then mouse rIL-12 standard (Genzyme) was added at concentrations ranging from 1.7 to 17.3 ng/ml and incubated for 1 h at 37°C. Then biotinylated rat anti-mouse IL-12 mAb (C17.5; Cambridge Bioscience) was used for the second Ab step for 45 min at 37°C and followed by streptavidin peroxidase (Serotec, Oxford, U.K.) at 2.5 μg/ml for 45 min at 37°C. Substrate addition and analysis of OD were as described for the IFN-γ ELISA. ELISA detection of murine IL-18 was performed as previously described, with a sensitivity of >300 pg/ml (17). Spleen cell cultures stimulated with B. pseudomallei or other reagents were established as described above. Cytokine secretion was then blocked by the addition of brefeldin A (BFA;3 Sigma, St. Louis, MO) for 3 h at a final concentration of 10 μg/ml. Brefeldin A was prepared as a stock solution of 10 mg/ml in DMSO. Spleen cells were washed once with 1% FCS-PBS adjusted to 0.5 × 106 cells/tube and stained for cell surface markers. The following FITC-labeled mAb were used for cell surface staining at 1–2 μg/tube: anti-CD4 (H129.19, rat IgG2a), anti-CD8a (53-6.7, rat IgG2a), anti-TCRαβ (H57-597, hamster Ig) (Sigma), anti-TCRγδ (GL3, hamster Ig), anti-pan-NK cells (DX5, rat IgM), anti-NK1.1 (PK136, rat IgG2a), and anti-CD44 (IM7, rat IgG2b) (PharMingen). Isotype-matched control Abs were included in each analysis. Staining of cell surface markers was performed for 30 min at 4°C; the cells were washed twice, then fixed with 2% paraformaldehyde-PBS for 20 min at 4°C, and permeabilized by the addition of 0.1% saponin-1% FCS-PBS. Cells were then incubated with 1 μg/tube PE anti-IFN-γ (XMG1.2, rat IgG1; PharMingen) for 45 min at 4°C in 0.1% saponin-1% FCS-PBS, washed twice with 0.1% saponin-1% FCS-PBS, and kept in PBS. Staining was analyzed for a total of 50,000 events gated on viable cells by forward/side scatter using a FACScan flow cytometer with CellQuest software (Becton Dickinson, Mountain View, CA). CD4+ or CD8+ cells were positively selected from naive spleen cells by using CD4+ (L3T4) or CD8+ (Ly-2) microbeads and MS+/RS+ columns, as described in the manufacturer’s instructions (Miltenyi Biotec, Bergisch Gladbach, Germany). Purified cells were then incubated with various combinations of cytokines for 18 h, and cells were collected for analysis of intracellular IFN-γ vs T cell markers. Female μMT mice at 10 wk of age were i.v. injected either with 1 × 107 CFU L. monocytogenes or 0.2 μg IL-12 plus 1 μg IL-18 or pyrogen-free saline. To assess bacterial burdens, spleen cells were collected 45 min and 16 h postinfection, prepared, and plated onto brain heart infusion agar (Difco, Detroit, MI) for bacterial colony counts. For intracellular IFN-γ vs cell marker analysis, spleen cells were cultured in 10 μg/ml BFA for 3 h, as previously described, in the presence of 50 ng/ml PMA and 100 ng/ml ionomycin before staining. IFN-γ plays an essential protective role within the first 24–48 h after infection with B. pseudomallei in vivo (4). To develop an in vitro culture system to identify the cellular sources of this rapid IFN-γ response, spleen cells from uninfected mice were incubated with γ-irradiated B. pseudomallei and culture supernatants collected and assayed for IFN-γ levels by ELISA at 24 or 48 h. Our initial experiments demonstrated that spleen cells from μMT mice consistently produced 4- to 5-fold higher levels of IFN-γ than C57BL/6 mice at all doses of bacteria tested; therefore, μMT mice were used for all subsequent experiments. As shown in this study, IFN-γ production was induced in a dose-response manner with maximal values observed with 1 × 106–107 B. pseudomallei/ml (Fig. 1⇓A). Dose-dependent induction of IFN-γ was also observed following incubation of B. pseudomallei with C57BL/6 rag−/− spleen cells, which possess functional NK cells but no T or B cells; however, the levels of IFN-γ produced were consistently 2- to 3-fold lower than with C57BL/6 cultures. In contrast, no IFN-γ was obtained using cells from CD3εTg26 transgenic mice that are deficient in both NK cells and T cells (data not shown). These results indicate that maximal induction of IFN-γ was observed in the presence of both NK cells and T cells. 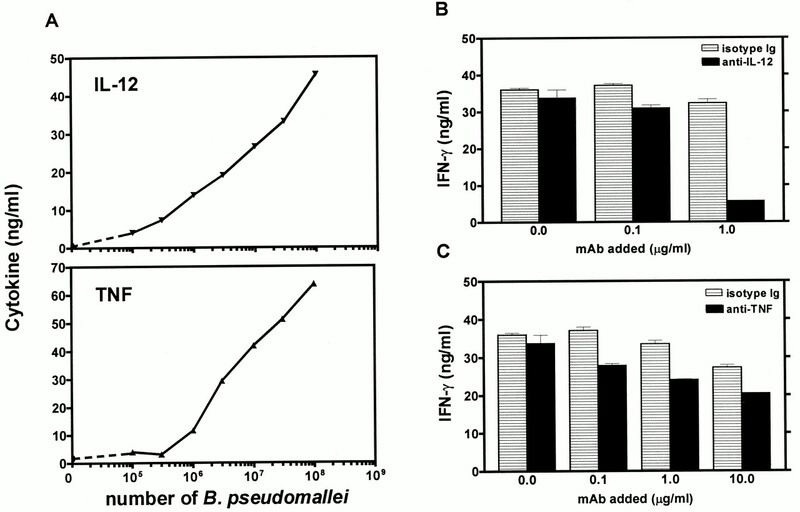 Dose response and kinetics of IFN-γ production in response to B. pseudomallei. 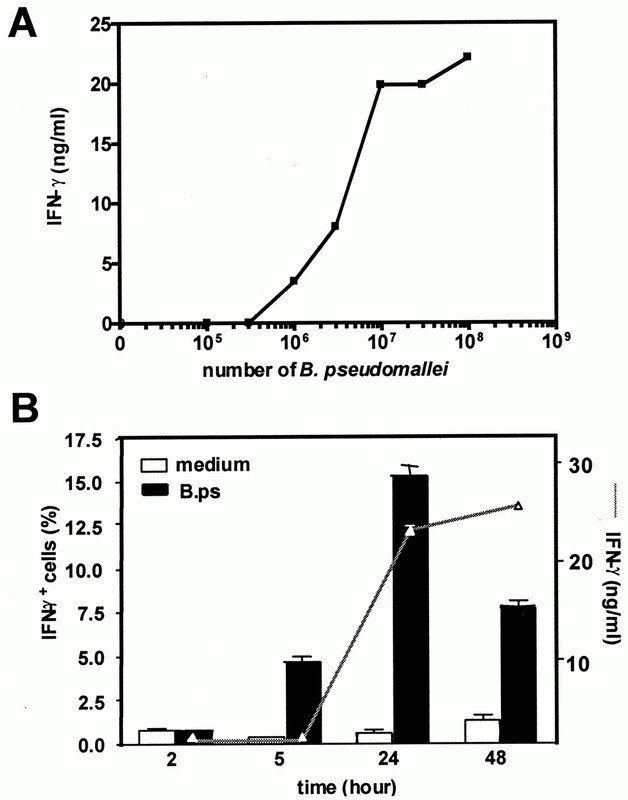 A, Spleen cells from uninfected μMT mice were incubated with various concentrations of B. pseudomallei or medium alone for 24 h and measured for IFN-γ by ELISA. B, Spleen cells were stimulated with 1 × 106/ml B. pseudomallei, supernatants were collected for IFN-γ assays by ELISA, and cells were harvested for intracellular IFN-γ staining at various time points. Results are presented as the mean ± SEM. To investigate the kinetics of the IFN-γ response, spleen cells were incubated with B. pseudomallei, and IFN-γ production assayed after 2, 5, 24, and 48 h. IFN-γ was not detectable by ELISA until 24 h and reached maximal levels within 48 h (Fig. 1⇑B). However, analysis of IFN-γ production by intracytoplasmic staining and flow cytometry demonstrated an increase in IFN-γ+ cells at 5 h, which peaked at 24 h.
To directly examine the cellular source of IFN-γ, spleen cells were stimulated with B. pseudomallei for 18 h, and stained for intracellular IFN-γ vs cell surface expression of NK cell (DX5) or T cell (TCRαβ, CD4, and CD8) markers (Fig. 2⇓). Isotype-matched Ig controls showed background staining of less than 0.2% in all experiments. The percentage of IFN-γ+ cells increased from a medium control of <0.5% to ∼10% following stimulation with B. pseudomallei. Of the IFN-γ+ cells, ∼60% were DX5+ NK cells and 40% TCRαβ+ cells. Of all NK cells, ∼28–30% was induced to secrete IFN-γ by B. pseudomallei, whereas up to 10% of all CD8+ T cells were IFN-γ secretors. In other experiments, three-color flow cytometry demonstrated that less than 1% of IFN-γ-producing CD8+ cells expressed NK1.1, and that essentially all IFN-γ+ NK1.1+ cells were also DX5+, arguing against the involvement of NK T cells under these conditions (data not shown). 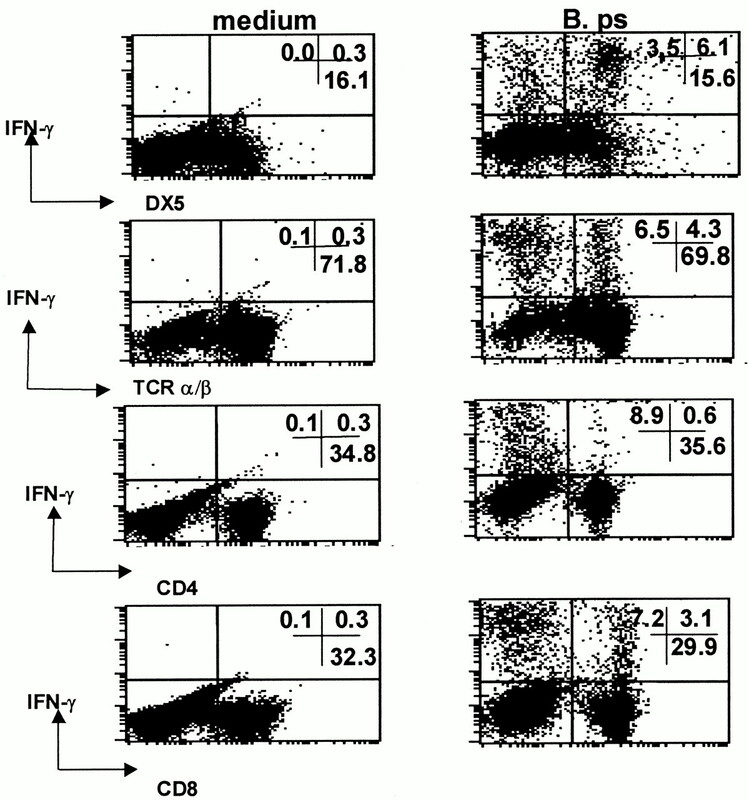 In all experiments performed, the frequency of IFN-γ+ CD4+ T cells was consistently lower than for CD8+ T cells (Fig. 2⇓). Expression of intracellular IFN-γ vs cell surface markers in response to B. pseudomallei. Uninfected spleen cells were incubated with medium alone or 1 × 106/ml B. pseudomallei (B.ps) for 18 h before analysis by flow cytometry. Numbers within quadrants represent percentage of positive gated cells, and data presented are representative of three independent experiments. The relative kinetics of IFN-γ production by NK cells vs CD8+ T cells was then compared. 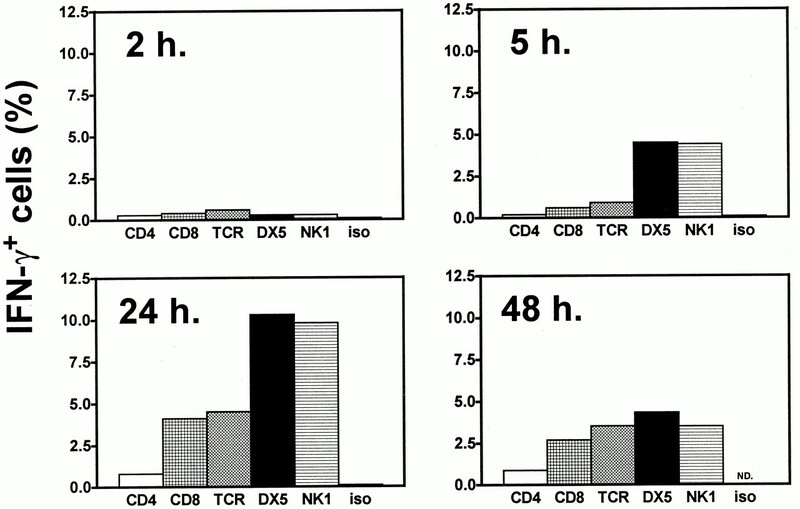 In this experiment, IFN-γ+ NK cells were first detected at 5 h, followed by CD8+ T cells at 24 h (Fig. 3⇓). By 48 h, the frequency of IFN-γ+ NK cells had declined, while the production from T cells remained elevated. Together, these results identify two major IFN-γ-positive cell populations, NK cells and CD8+ T cells, which are rapidly induced by B. pseudomallei in vitro. Kinetics of intracellular IFN-γ expression in NK cells vs T cell subsets in response to B. pseudomallei. Uninfected spleen cells were stimulated with 1 × 106/ml B. pseudomallei and harvested for intracellular IFN-γ staining vs expression of either CD4, CD8, TCRαβ, DX5, or NK1.1 markers at various time points. Data represent percentage of positive gated cells. Medium alone produced less than 0.2% IFN-γ-positive cells (data not shown in figure). Iso, Isotype control Ab for cell surface staining. Previous studies by Sprent and colleagues (18, 19) have shown that bacterial components such as LPS can preferentially activate memory (CD44high) CD8+ T cells rather than naive (CD44low/int) cells for proliferation in vitro and in vivo. To compare the response of naive vs memory CD8+ T cells to B. pseudomallei, spleen cells from uninfected mice were incubated with B. pseudomallei for 15 h and stained for intracellular IFN-γ vs CD8 and CD44 markers by three-color flow cytometry. As shown in Fig. 4⇓, under these conditions essentially all highly IFN-γ+ CD8+ T cells also expressed high levels of CD44 (CD44high), suggesting an activated/memory phenotype. Comparison of CD44 expression vs production of IFN-γ in CD8+ T cells in response to B. pseudomallei. Uninfected spleen cells were incubated with medium alone or 1 × 106/ml B. pseudomallei (B.ps) for 15 h before analysis by three-color flow cytometry. Data presented refer to the relative expression of IFN-γ vs CD44 in the CD8+ cell fraction. In other pathogen models, TNF-α and IL-12 are two major stimulators of IFN-γ production during the innate immune response (6). To investigate the role of these cytokines in response to B. pseudomallei, spleen cells were stimulated with bacteria and cell culture supernatants assayed for levels of IL-12, TNF, and IFN-γ by ELISA after 24 h. Addition of B. pseudomallei induced secretion of both IL-12 and TNF in a dose-dependent manner (Fig. 5⇓A), which correlated well with the induction of IFN-γ (Fig. 1⇑A). Roles of TNF vs IL-12 on IFN-γ induction by B. pseudomallei. Uninfected spleen cells were stimulated with various concentrations of B. pseudomallei for 24 h, and supernatants were assayed for TNF and IL-12 by ELISA (A). Cells were treated as above, but in the presence of neutralizing mAbs specific for IL-12 (B) or TNF (C) vs isotype-matched control Abs and assayed for IFN-γ by ELISA. Data presented are average of duplicate samples from one representative of three experiments. To ask whether the IL-12 and TNF produced in the cultures contribute to the induction of IFN-γ, neutralizing mAbs to these cytokines were added at the time of addition of B. pseudomallei. Addition of 0.1–1 μg/ml Ab to IL-12 inhibited IFN-γ production by up to 80%, as assayed by ELISA (Fig. 5⇑B). In contrast, anti-TNF-α was less effective, giving ∼30% inhibition even at 10 μg/ml (Fig. 5⇑C). These results were confirmed using flow cytometry and showed the effects of neutralizing IL-12 on the production of IFN-γ by both NK cells and CD8+ T cells, whereas neutralizing TNF showed partial effects on NK cells and even less on CD8+ T cells (data not shown). These results suggest that IFN-γ production by both NK cells and CD8+ T cells requires IL-12, but that TNF-α is less important. IL-18 is an important inducer of IFN-γ secretion in response to LPS and has been implicated in resistance against several intracellular pathogens (20, 21). To evaluate the role of IL-18 in the IFN-γ response seen in this study, supernatants from spleen cells stimulated with B. pseudomallei were collected after 24 h and assayed for IL-18 by ELISA. High levels of IL-18 were induced in a dose-dependent manner by B. pseudomallei, which correlated with the induction of IFN-γ measured at 48 h (Fig. 6⇓A). Addition of 0.1–10 μg/ml monoclonal rat anti-IL-18 into spleen cell cultures stimulated with the optimal dose of B. pseudomallei progressively reduced IFN-γ production. 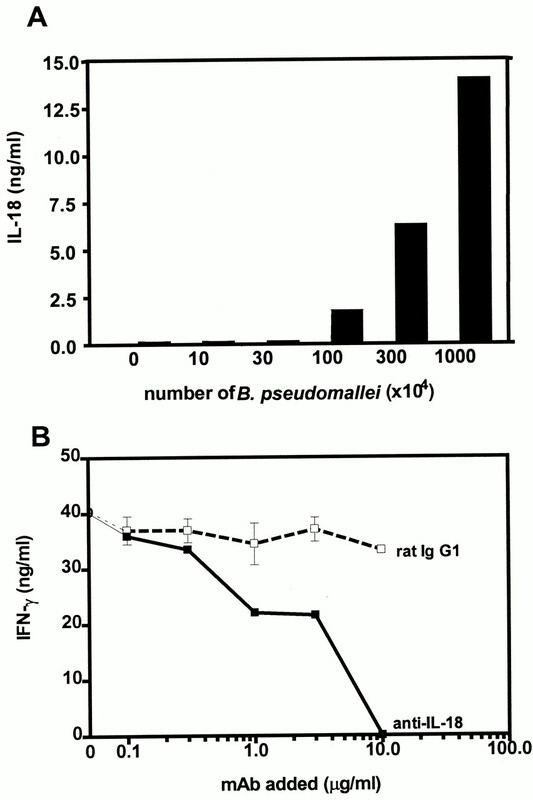 Complete inhibition was observed with ≥10 μg/ml anti-IL-18, while the same concentration of a rat IgG1 isotype-matched control had no effect (Fig. 6⇓B). 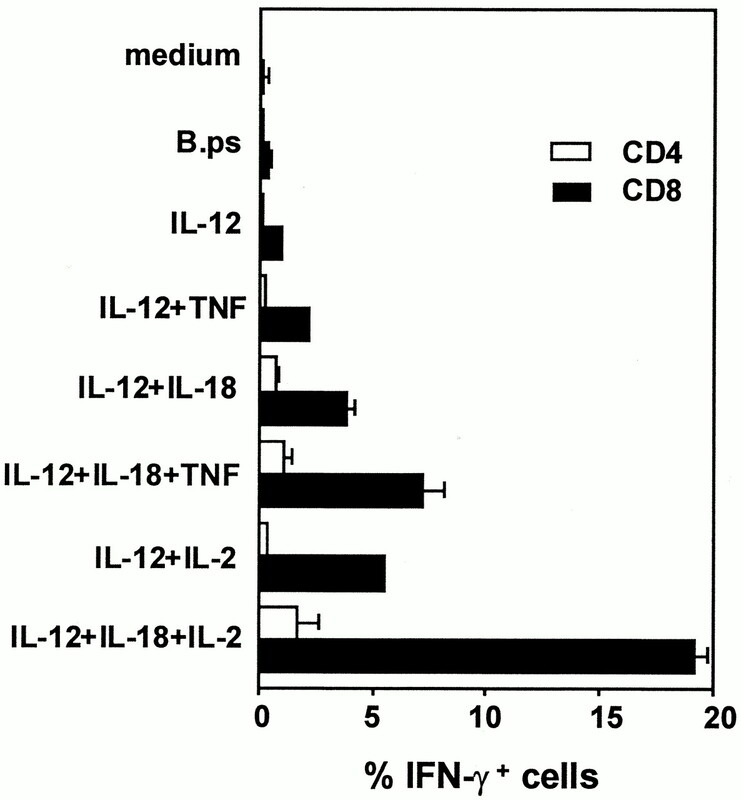 Taken together, the above results indicate that B. pseudomallei is a potent inducer of both IL-12 and IL-18, and that these two cytokines are obligatory for the subsequent production of IFN-γ by both NK cells and CD8+ T cells. Role of IL-18 on IFN-γ induction by B. pseudomallei. Uninfected spleen cells were stimulated with various concentrations of B. pseudomallei, and supernatants were harvested for IL-18 assay at 24 h. Data presented are average of duplicate samples (A). B, Spleen cells were treated with 3 × 106/ml B. pseudomallei in the presence of increasing concentrations of either rat anti-IL-18 mAb or rat IgG1 isotype control and assayed for IFN-γ by ELISA after 48 h. Results are mean ± SEM from one representative of two independent experiments. To ask whether the preferential activation of both NK cells and CD8+ T cells also occurs with other intracellular bacterial pathogens, spleen cells were incubated with γ-irradiated L. monocytogenes, and IFN-γ production was assayed by ELISA and flow cytometry. L. monocytogenes induced the dose-dependent secretion of IFN-γ that peaked at between 3 × 105 and 1 × 106 bacteria/ml (data not shown). Intracellular IFN-γ vs cell surface marker analysis demonstrated that both IFN-γ-producing NK cells and CD8+ T cells had responded to L. monocytogenes, again showing a CD8+ rather than CD4+ T cell preference as observed with B. pseudomallei (Fig. 7⇓A). Furthermore, direct addition of rIL-12 plus IL-18 mimicked the IFN-γ responses observed with intact bacteria. Addition of either IL-12 or IL-18 alone had minimal effects on IFN-γ synthesis, consistent with the known synergistic actions of these two cytokines in other systems (10). The results suggest that cytokine-mediated activation of CD8+ T cells (and NK cells) is not unique to B. pseudomallei and point to the key role of IL-12 and IL-18 in this response. 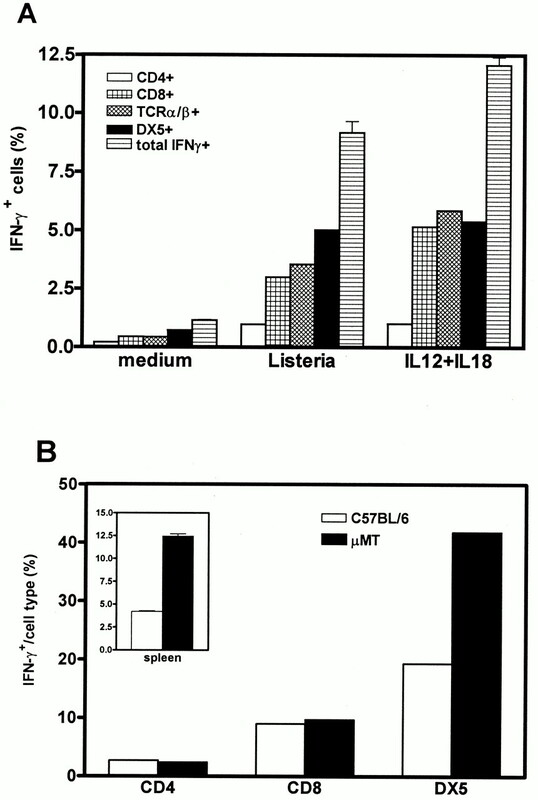 A, Induction of IFN-γ by L. monocytogenes vs IL-12 plus IL-18. Uninfected spleen cells were stimulated for 48 h with 3 × 106/ml L. monocytogenes or 1 ng/ml IL-12 plus 5 ng/ml IL-18 and assayed for intracellular IFN-γ-positive cells by flow cytometry. Data represent mean percentage of positive gated cells ± SEM from one representative of two independent experiments. B, Induction of IFN-γ by B. pseudomallei in C57BL/6 vs μMT mice. Uninfected spleen cells from C57BL/6 or μMT mice were incubated with medium alone or the optimal dose of 3 × 106/ml B. pseudomallei for 18 h and assayed by flow cytometry for intracellular IFN-γ vs CD4, CD8, or DX5. The results shown represent the percentage of each cell type (CD4+, CD8+ vs DX5+), which are IFN-γ+ from one representative of three similar experiments. Inset, Data shown are percentage of total IFN-γ-positive cells regardless of surface phenotype. Error bars were calculated from triplicate cultures assayed individually. To confirm that the results obtained within μMT spleen cells were also applicable to the immunocompetent host, uninfected spleen cells from μMT and C57BL/6 mice were stimulated with B. pseudomallei for 18 h before detection of intracellular IFN-γ. The total frequency of IFN-γ+ cells was lower in C57BL/6 than μMT spleen cells, consistent with measurement of IFN-γ by ELISA (data not shown). However, analysis of surface phenotypes revealed preferential activation of CD8+ and NK cells in both mouse strains, with the frequency of IFN-γ+ CD8+ T cells being essentially identical (Fig. 7⇑B). Interestingly, the increased capacity for total IFN-γ production by μMT spleen cells (Fig. 7⇑B, inset) appeared to be mediated by the NK cell population. To directly compare IFN-γ production by these two T cell subsets, CD4+ or CD8+ T cells were purified from the spleens of uninfected mice by positive selection using immunomagnetic beads and stimulated with either bacteria or combinations of cytokines for 18 h. Addition of B. pseudomallei to purified CD8+ or CD4+ T cells did not induce IFN-γ production above unstimulated controls (Fig. 8⇓). In contrast, CD8+ rather than CD4+ T cells responded efficiently to the combination of exogenous IL-12, IL-18, and TNF, which is found in unfractionated spleen cell cultures in the presence of B. pseudomallei, as described above. This cytokine combination resulted in similar frequencies of IFN-γ+ CD8+ T cells as unfractionated spleen cells stimulated with B. pseudomallei. Stimulation with IL-12 and IL-18 plus IL-2 was shown to induce the greatest response with 18–20% of all CD8+ T cells becoming IFN-γ positive vs 2–3% of CD4+ T cells. In summary, these observations suggest that the IFN-γ response to B. pseudomallei is triggered indirectly via the action of IL-12 and IL-18 and that CD8+ T cells are intrinsically more responsive to these signals than CD4+ T cells. 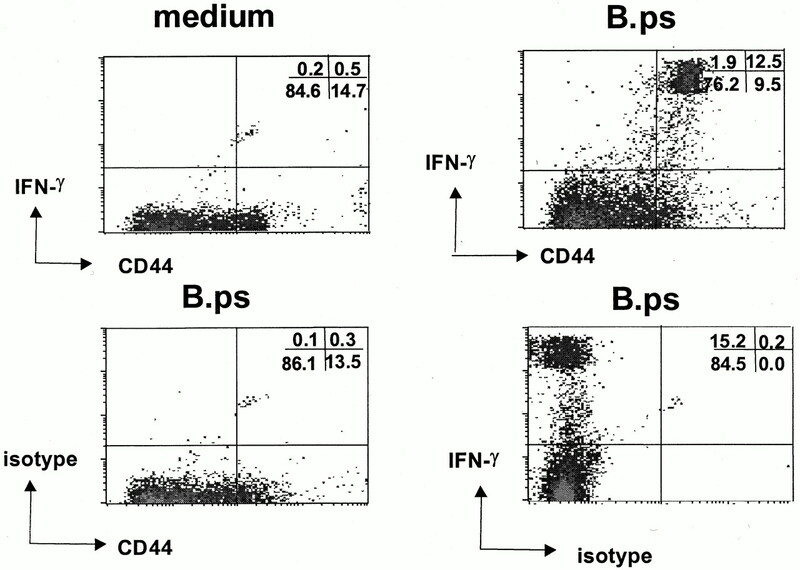 Effects of cytokines on intracellular IFN-γ expression by purified CD4+ vs CD8+ T cells. CD4+ or CD8+ T cells from uninfected μMT spleen cells were purified by immunomagnetic beads and stimulated with medium alone, 1 × 106/ml B. pseudomallei, or various cytokine combinations (5 ng/ml each) for 18 h and assayed by flow cytometry for expression of intracellular IFN-γ vs CD4 or CD8. Results are mean ± SEM from one representative of two independent experiments. Finally, we investigated whether the rapid and preferential activation of CD8+ T cells and NK cells also occurs in response to bacterial infection in vivo. Mice were infected i.v. with viable L. monocytogenes and assessed for IFN-γ expression ex vivo after 16 h. Compared with saline-treated controls, mice infected with viable L. monocytogenes showed a preferential induction of IFN-γ+ CD8+ and NK cells, but not CD4+ T cells (Fig. 9⇓). Bacterial burdens immediately after infection were 2 × 104, and at the time of spleen cell harvest were 3.5 × 104 bacterial CFU/spleen. A similar but reduced induction of IFN-γ+ CD8+ and NK cells was seen following IL-12 + IL-18 injection in the absence of bacteria. The results indicate that the rapid activation of CD8+ T cells (and NK cells) to produce IFN-γ also occurs in response to bacterial infection in vivo. Induction of IFN-γ by L. monocytogenes or IL-12 plus IL-18 in vivo. μMT mice were infected i.v. with 1 × 107 L. monocytogenes (LM) or injected with 0.2 μg IL-12 plus 1 μg IL-18 (12 + 18) or pyrogen-free saline (PFS). Sixteen hours after infection, spleen cells were incubated in 10 μg/ml BFA, 50 ng/ml PMA, and 100 ng/ml ionomycin for 3 h before staining for intracellular IFN-γ vs CD4, CD8, or DX5. Each bar represents the mean ± SEM of three mice. Experiments were repeated twice with similar results. Results are expressed as percentage of IFN-γ+ cells within each cell population. B. pseudomallei induces a protective IFN-γ response within 24–48 h after primary infection in mice (4). In this study, we describe an in vitro model using spleen cells from previously uninfected mice to investigate the cellular sources and regulation of this response. Our data show that B. pseudomallei is a potent and rapid inducer of IFN-γ production by murine spleen cells. This response could be detected intracellularly in NK cells within 5 h and in CD44high activated/memory phenotype CD8+ T cells by 15 h after contact with the bacterium. However, there was little production by CD4+ T cells at any time point examined. Neutralization of IL-12 or IL-18 abolished IFN-γ production by both responding cell types. Furthermore, recombinant IL-12 plus IL-18 induced IFN-γ production with similar magnitude and T cell subset preference as intact bacteria. Together, these data suggest that cytokine-mediated bystander activation of CD8+ T cells contributes to the initial IFN-γ response to bacterial pathogens. Previous studies with a diverse range of pathogens, including bacteria, protozoan parasites, and some viruses, have demonstrated the role of NK cells in IFN-γ production during the innate immune response (6, 22, 23). In this study, addition of B. pseudomallei to naive spleen cells resulted in the rapid activation of DX5+/NK1.1+ cells for IFN-γ production. Recent evidence suggests that several distinct T cell populations also have the potential to make IFN-γ with an intermediate kinetics between the rapid NK cell response and the acquisition of acquired immunity (24, 25). These include NK T cells (26, 27), γδ T cells (11, 28), CD4− CD8− (29), or CD8+ T cells responding to microbial products presented via the CD1 system (30, 31) and other CD8+ T cells triggered via recognition of N-formylated bacterial peptides via the H2-M3 Ag presentation system (32). Several other cell types, including macrophages, B cells, and dendritic cells, have also been reported to secrete IFN-γ (33, 34, 35). However, we do not believe that these cell types contribute substantially to the IFN-γ responses described in this work. Thus, NK cells plus CD8+ TCRαβ+ cells together account for greater than 90% of all IFN-γ-positive cells under these conditions. We have used μMT mice for many of these experiments, because they produce greater levels of IFN-γ in response to B. pseudomallei, presumably due to the relative enrichment of T cells and NK cells in culture. However, the relative proportion of IFN-γ+ CD8+ vs IFN-γ+ CD4+ T cells described above was also observed in immunocompetent C57BL/6 spleen cells. Several lines of evidence suggest that the activation of CD8+ T cells seen in this study is a consequence of cytokine-mediated bystander events rather than through engagement of the TCR. First, these responses were observed in spleen cell cultures from naive animals and were maximal within 15–18 h after addition of bacteria in vitro. Second, up to 10% of all CD8+ T cells are driven into IFN-γ production within this period. Third, the responses to intact bacteria were abolished by neutralization of IL-12 or IL-18 in vitro, and could be mimicked by addition of the recombinant cytokines in the absence of bacteria. Finally, Ag-specific activation is unlikely to show such pronounced bias in favor of CD8+ T cells given that dead bacteria are most likely to favor the exogenous Ag presentation pathway and activation of class II-restricted CD4+ T cells (36). Our data show a consistent preference for the generation of IFN-γ-secreting CD8+ rather than CD4+ T cells in response to either intact bacteria or IL-12 plus IL-18. Studies by Tough and Sprent et al. (37, 38) have shown that memory CD8+ T cells are preferentially responsive to bacterial LPS, CpG DNA, and downstream cytokines such as type I IFNs and IL-15 for incorporation of 5-bromo-2′-deoxyuridine and cell proliferation. This has been suggested to underlie the Ag-independent maintenance of memory CD8+ T cells in vivo via bystander activation by cytokines generated from exposure to antigenically unrelated organisms. Analysis of CD44 expression profiles in our experiments showed that CD44high rather than CD44low/int CD8+ T cells preferentially expressed IFN-γ following activation by B. pseudomallei. Thus, activated/memory CD8+ T cells exhibited preferential IFN-γ expression compared with naive cells by these criteria. The patterns of basal or induced expression of receptors for IL-12 and IL-18 may explain both the distinct kinetics of the NK cell vs CD8+ T cell responses as well as the pronounced bias in CD8 vs CD4 activation seen in this study. NK cells, which become IFN-γ positive within 5 h after addition of bacteria, are reported to constitutively express receptors for both cytokines (39, 40). In contrast, splenic CD8+ T cells from uninfected mice express low levels of IL-18R, but show increased receptor transcripts and functional responsiveness to IL-18 within several hours after activation with IL-12 (35). Furthermore, induction of IL-18R expression is significantly greater in CD8+ than CD4+ T cells (41), consistent with the T cell subset preferences we observe. Studies are in progress to test whether changes in IL-18R underlie the distinct kinetic and phenotypic characteristics of the IFN-γ response to B. pseudomallei. Our results support the growing evidence that resistance to B. pseudomallei is strongly influenced by the cell-mediated immune response and, in particular, the production of IFN-γ. Mice depleted of IFN-γ by either mAbs or gene deletion showed markedly increased susceptibility to lethal infection in vivo (4). B. pseudomallei grows intracellularly in both human and murine macrophages or macrophage cell lines, but can be killed by both NO- and oxygen-dependent mechanisms following activation of the cells with IFN- γ in vitro (3). Furthermore, genetically determined resistance of different mouse strains to B. pseudomallei correlates with the induction of type 1 rather than type 2 immune responses, as measured by the preferential induction of IgG2a vs IgG1 (42). We now demonstrate directly that IL-12 and IL-18, two cytokines that are key determinants in the generation of type 1 T cell responses, are rapidly produced in response to B. pseudomallei in the naive host and serve to generate an IFN-γ-enriched environment within the first few hours after contact with the bacterium. These results are also consistent with our previous demonstration that neutralization of IL-12 increases the susceptibility of mice to infection with B. pseudomallei in vivo (4). The mechanisms of immunity to melioidosis in humans are less well understood. Incubation of B. pseudomallei with PBMC of healthy individuals results in the rapid secretion of IFN- γ, IL-12, and IL-18, although the nature of the responding cells is not known (43). However, high levels of IFN- γ, IL-18, IL-12p40, and IL-15 have been reported in the serum of patients presenting with acute septicemic melioidosis, and in the case of IL-18 and IFN-γ were higher in nonsurvivors, although these differences did not reach statistical significance (43). Plasma concentrations of IL-6, IL-8, and TNF are also elevated in septicemic melioidosis and correlate with disease severity and clinical outcome (44, 45). It therefore seems that B. pseudomallei induces a similar spectrum of proinflammatory cytokines in both humans and mice. From these studies and data from other pathogen models, we predict that these cytokines will contribute to resistance in the majority of the population living in endemic areas, which show no signs of clinical disease, but can nevertheless also contribute to the pathology of septic shock when immunity fails due to underlying factors such as diabetes. In conclusion, the results presented in this work reaffirm the prominent role of NK cells as rapid and effective producers of IFN-γ in response to bacterial pathogens. In addition, we highlight a substantial contribution from CD8+ TCRαβ+ T cells responding to cytokines in an Ag-independent manner. Yoshimoto et al. (35), using recombinant cytokines as stimuli, first suggested the potential importance of Ag-independent T cell activation via IL-12/IL-18 in innate immunity. To our knowledge, the data presented in this study provide the first direct evidence that pathogens can actually trigger this pathway, supporting the possibility that bystander CD8+ T cell activation may contribute to IFN-γ-mediated resistance to infection in vivo. Our findings that CD8+ T cells (as well as NK cells) are induced to express IFN-γ within 16 h after challenge with viable L. monocytogenes in vivo support this concept. Together, these data suggest that bystander cytokine activation of CD8+ T cells may operate at several levels in contributing to host immunity: first, by providing an additional source of IFN-γ during the early phase of response to infection; second, in expansion of effector T cells (46); and third, by nonspecifically maintaining the memory T cell pool (47). These results imply that prior antigenic experience provides the host not only with specific memory T cells, but a pool of cells, which collectively can contribute to innate immunity against subsequent unrelated infection. Thus, we believe that both NK cells and CD44high CD8+ T cells respond to cytokines produced by phagocytic cells following contact with intracellular pathogens and may provide the initial sources of IFN-γ following infection. We thank Paul M. Kaye and David F. Tough for their valuable suggestions, and Pitak Santanirand for providing B. pseudomallei. ↵1 G.L. is supported by the Ministry of University Affairs, the Royal Thai Government. G.C. and C.A.H. are supported by Grant 42334 from the National Institutes of Health. 3 Abbreviation used in this paper: BFA, brefeldin A.